This article is a short summary of New Super Mario Bros. U Deluxe. 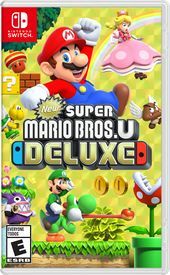 New Super Mario Bros. U Deluxe is a 2D platforming game and port of the Wii U launch title New Super Mario Bros. U, released for the Nintendo Switch in January 2019. The game includes both the base game and the New Super Luigi U expansion. Two games in one, for double the fun! Simple, straightforward controls, new playable characters optimized for younger and less-experienced players, and a wealth of bonus content—like a Hints gallery and helpful reference videos—make this a perfect choice for anyone looking to introduce their family to the wonderful world of Mario. All a player needs is one Joy-Con™ controller, so two people can team up right out of the box! Tackle 164 platforming courses in the two main game modes and enjoy extra replayability with three additional game modes in which you can also play as a Mii™ character: Challenges, Boost Rush, and Coin Battle! New Super Mario Bros. U Deluxe includes every stage from both the base game and New Super Luigi U. Players can now play as any of the playable characters in single-player, which includes being able to play as Mario and Nabbit in both games, previously being exclusive to New Super Mario Bros. U and New Super Luigi U respectively. In addition, Toadette has been added as a new playable character for both games. She is the only character who can use the new Super Crown power-up that transforms her into Peachette, which gives her the ability to glide as well as a midair jump, similar to the Flying Squirrel form. ↑ 1.0 1.1 New Super Mario Bros. U Deluxe - Announcement Trailer - Nintendo Switch. Nintendo (YouTube; September 13, 2018). Retrieved October 31, 2018. ↑ NewスーパーマリオブラザーズU デラックス [Nintendo Direct 2018.9.14]. Nintendo 公式チャンネル (YouTube; September 13, 2018). Retrieved October 31, 2018. ↑ New Super Mario Bros. U Deluxe – Nintendo Switch Announcement Trailer. Nintendo UK (YouTube; September 13, 2018). Retrieved October 31, 2018. ↑ New Super Mario Bros. U Deluxe – Nintendo Switch Announcement Trailer. NintendoAU (YouTube; September 13, 2018). Retrieved October 31, 2018. This page was last edited on 15 January 2019, at 23:53.